Jane: Aren't you supposed to be neutral? UN Sgt. Marchand: You can't be neutral when facing murder. Doing nothing to stop it is taking sides. To say that I have a fascination with Jean Pierre Jeunet's Amelie is a bit of an understatement. Having seen the film countless times, I still find myself filled with the sort of glee found only in the best motion pictures. Why is this important in a review of Danis Tanovic's No Man's Land? Well, to put it simply, I was a bit soured by its surprise victory over Amelie at this years Academy Awards® in the category of Best Foreign Language Film. I kept asking myself, how could this film eclipse the simple and understated brilliance of Jeunet's film, or even the refreshing Lagaan as THE best foreign film released in 2001? I searched for No Man's Land in my area and found it at a second-run art theater. To my surprise, I discovered it indeed is equal, if not the superior, to Jeunet's film, deserving its acclaim and a lot more. It deserves to be mentioned along with Mulholland Drive, Black Hawk Down, Amelie, and Waking Life as one of the best films of 2001. 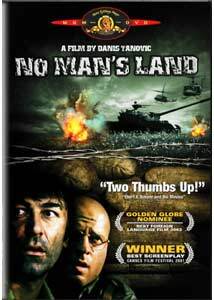 No Man's Land takes place in a single day in June of 1993 in the midst of the Serbian/Bosnian conflict. An injured Bosnian soldier named Ciki has witnessed nearly his entire group die in front of him after an ambush by Serbian forces. He is hit in the left shoulder as he retreats to hide in a trench dug by the Serbs. On the opposite side is Nino, a newly-recruited soldier who is sent with another soldier (Nadarevic) to check for survivors of the ambush. Their search leads them to the trench where Ciki is hiding, and soon there is a confrontation, which results in the injuring of Nino and the death of his comrade. While these two wounded men suffer, their plight is eclipsed by that of Cera (Sovagovic), a Bosnian, who rests on a bomb certain to kill him and everyone in a fifty yard radius if he rises from the ground. At first it seems as though the two will have to struggle through their differences if either hopes to return to their homes and continue fighting the war, but as is often the case, such circumstances prevent this. First, Sgt. Marchand (Siatidis), a UN peacekeeper, hopes to make a difference by working out the conflict of Ciki and Nino. Then a news reporter (Cartlidge) tries to get an exclusive story on the two men, as well as Cera, in the hopes of making a name for herself. Soon, though, the two will realize that in order to achieve their goals they will have to reach beyond politics and boundaries to obtain what they think is right. While the plot of No Man's Land may seem ripe for both intense action as well as numerous scenes of the two sworn enemies bonding, Tanovic's screenplay and direction thankfully take us in an opposite, unexpected direction. Tanovic, who was a camera operator during the conflict, understands that the war is not so much about the people but the beliefs, and at times even those who fight don't really know how it started. Tanovic does a superb job of building the characters from the outset, never showing an allegiance to one side or the other, crafting each character with flaws and strengths. As Tanovic masterfully brings us into the situation he is wise to pass on the bonding scenes between the two men; they dislike each other and that is how it will stay until the shocking, surprise conclusion. The central message of the film lies in the story of both the UN and press involvement. For Marchand, his work is nothing more than babysitting a conflict he feels he has no business being involved in. For his superiors—many of whom would rather play chess than show an active interest in the war—this is a political mission, and each is careful not to offend anyone, especially if it means being embarrassed on television. Tanovic attempts to convey the futility and stupidity of war by showing how it is a kind of entertainment for some and all politics for others. Scenes of the UN and the media creating frenzy over the activity in the trench are intercut with moments of relaxation with other Bosnian and Serbian soldiers watching events from a distance; one is even seen either sleeping or reading a newspaper throughout the entire conflict. Tanovic wisely directs the film at a relaxed pace, allowing each event to resonate before the next occurs. Even at the climax of the film, after it seems that the final point has been made, he stuns the audience once again with a lasting final image that sum up the entire film in a single moment. War is never the same for everyone and those who fight for what they believe is right almost always fall victim to those with outside interests trying to forward their own agendas. Image Transfer Review: At the start of No Man's Land, the transfer gets off on the wrong track. The 2.35:1 anamorphic image shows the fog drenched scene at its worst, with poor definition and an abundance of grain. Thankfully, once the film shifts to daylight it looks fantastic. Flaws and print scratches are at times a problem, but for the most part the transfer is nearly pristine. Sharpness and detail are done nicely, producing a film-like look. Colors are also nice with no bleeding, and shadow detail seems perfect. A horribly cropped full-frame image is also offered. Audio Transfer Review: Presented in Serbo-Croatian 5.1, the Dolby Digital 5.1 track is, as one would expect, quite active in scenes involving the war and is more subdued in quieter scenes. Beginning in chapter 2 through chapter 4, the sounds of explosions and gunfire envelops the room and seem amazing realistic, creating a very convincing mix. From that point on, dialogue takes control and is crisp and clear with very little distortion. The only problem I could find was that it seemed to have been mixed at a lower volume level than usual; I checked several other DVDs and each played extremely loud at the same level at which I was enjoying No Man's Land. Extras Review: The original theatrical trailer is presented in 1.85:1 nonanamorphic widescreen. Film-themed menus are also offered, as is a simple, eloquent director's note included in the insert of the disc. No Man's Land is as powerful a film as I have seen recently and it deserves the attention of anyone who appreciates fine cinema. It is rich in cynicism, emotion, and even a bit of humor. In short, it is what every film should strive to be.